It’s a pretty safe bet to say that all of us have suffered from an unwanted spot or blemish at some point in our life, usually when we have a big party or photo opportunity coming up! The occasional spot or blemish is one of life’s unexpected annoyances, and although they are sometimes impossible to prevent, there are steps that you can take to help to keep them away. One of the main reasons why blemishes appear is down to blocked pores. It’s important to keep pores as clean as possible, otherwise you could wake up with an unwanted addition to your skin. 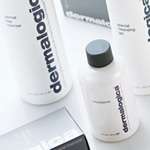 Whatever your skin type, it’s vital that you invest in an effective cleanser, and use it religiously morning and night. Dermalogica have an unbeatable line of cleansers that are specially tailored to different skin types– so you can be sure than your skin will be left squeaky clean without feeling dry and dehydrated. For those who wear make-up, taking it all off before your head hits the pillow is absolutely vital, as heavy make-up combined with a days worth of grime are prime culprits in the appearance of spots. Allow your pores to breathe easy and experience clearer, fresher skin.